WORCESTER, Mass. – While the Hawks had not trailed at all in their playoff run and rarely trailed over the course of the season, Milford coach Steve DiVitto insisted after each game that his team knew how to bounce back and overcome a deficit to win. Milford (25-1) waited until the final game of the season to prove him right. Despite falling behind by three runs in the second inning of Saturday evening’s Div. 1 state championship game at Worcester State University’s Rockwood Field, the Hawks’ confidence never wavered. 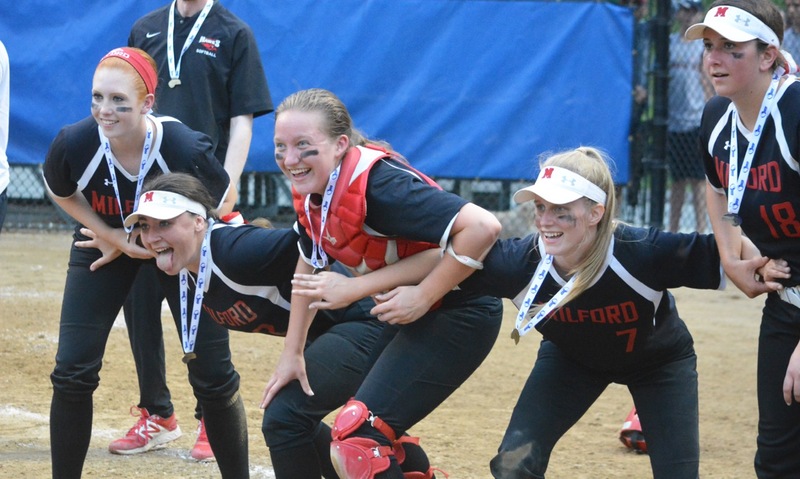 Senior pitcher Ali Atherton retired 16 of the final 19 batters she faced and the prolific Milford offense found its swing to pull out a 7-3 victory and earn the program’s first state title since winning the second of two straight titles 2013. Milford had gone 15 innings without allowing a run (since the seventh inning of the South semifinal against Hopkinton) before the Mountaineers came to bat in the top of the second. The Central champions, making their first state title game appearance, seemed to figure out Atherton. A single and an error put the first two hitters in scoring position and senior catcher Lizzie Miles drove a single to right that scored both runs. Kiana Lloyd followed with a hit to left, but Maggie Farrell fired to the plate and Emily Hartman just hung on to cut down Miles trying to score. Lloyd moved up to second on the throw and then to third on a wild pitch before scoring on a Paige Arvidson infield single. Milford bounced right back in the bottom half of the inning. Hartman was hit by a pitch to lead-off and Kelley Reichert beat out an infield single. With one out, Shannon Cormier reached on an error to load the bases for Kate Irwin and the energetic centerfielder got the Milford bench going with an infield hit to score one. 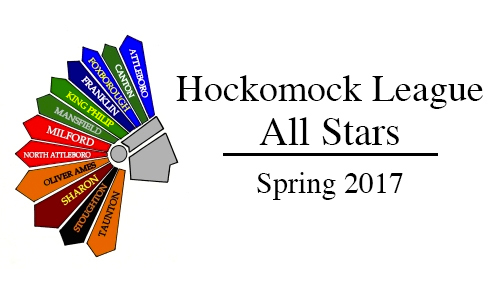 Hockomock League MVP Emily Piergustavo drove in a run with a sacrifice fly and the lead was down to one. Atherton allowed only two Wachusett hits over the final five innings, as she started to look more like the pitcher that had thrown back-to-back shutouts to reach the final. In the bottom of the fourth, Milford took the lead. Cormier worked a one-out walk and two batters later Piergustavo drove a ball that one-hopped the centerfield fence for a game-tying double. Farrell, another of the team’s three seniors, followed with a single that plated Piergustavo with what turned out to be the game-winning run. Wachusett tried to put together a rally of its own in the sixth inning. Brigid Griffin singled to left just past the dive of Piergustavo, but was forced out at second on Courtney Lanpher’s grounder. Lanpher then went first-to-third on a grounder back to the pitcher to put the tying run only 60 feet away with two outs. A fly ball to Cormier in right ended the threat and allowed Milford to breathe a sigh of relief. In the bottom half of the inning, the Hawks broke the game wide open and calmed nerves both on the field and in the bleachers. Cormier, Irwin, and Piergustavo each singled to start the sixth and load the bases. Farrell drove in her second run with a sac fly to left and junior Jess Tomaso brought in another with a single to right. Senior Kaitlyn DeCapua made it 7-3 with another sac fly and the trophy felt like it was in Milford’s grasp. A comebacker to Atherton and a leaping grab on a line drive by Cormier put the Hawks on the brink and fittingly it was DeCapua who would record the final out, pulling in a foul pop fly to seal the championship that she and the other seniors had been dreaming about for four years. The seniors were not the only newcomers to the team four years ago. DiVitto also took over as the new head coach that spring and immediately had to answer questions about how to replace a class that won three state titles. He had his answer on Saturday. “Four years ago, this journey started with these four seniors,” DiVitto remarked, “and four years ago it was the question of where is this program going to go because of the great graduating class in 2013 and how are you going to replace all of them? TAUNTON, Mass. – On Saturday afternoon, Milford played a near perfect game to hand Silver Lake its first loss of the season and win the Div. 1 South title. On Tuesday night in the state semifinal, back at Taunton High’s Jack Tripp Field, the Hawks showed that even when not at their best, they have enough grit to come out on top. Despite Newton North putting runners in scoring position in five of the seven innings, Milford escaped unscathed each time and scored a pair of unearned runs to grind out a 3-0 victory and advance to the state championship game for the first time since winning the Div. 1 title four years ago. “It’s great to know that maybe the bats aren’t at their best and our defense at times wasn’t at its best and Ali [Atherton] in a couple of innings maybe wasn’t at her best, but when push came to shove, man did they step up,” said Milford coach Steve DiVitto, who joined the program along with this senior class and will be making his first state final appearance this weekend. Atherton, the senior pitcher, tossed a one-hitter in the South final against the Lakers, but the Tigers beat that total in the top of the first. With runners at second and third and two outs, Atherton struck out her opposite number Madison Schaefer to get out of the jam. The Hawks took the lead in their first at-bats. Emily Piergustavo drew a one-out walk, followed by a Maggie Farrell single to right. Jess Tomaso lined a single to right that brought in the opening run and moved Farrell to third. Schaefer avoided a big inning by getting a bouncing ball right back to her and a strikeout to end the threat. The Tigers put the lead-off runner on in the second on a rare Milford error. After a strikeout and a sliding catch by centerfielder Kate Irwin on a sinking line drive, the Tigers loaded the bases with back-to-back singles. Again, Atherton was able to bear down and get a fly ball to end the inning. Milford doubled its lead in the bottom of the second. Maddy Bonvino drew a one-out walk and, after a fly ball out, stole second to get into scoring position for Irwin. The junior lead-off hitter singled to center and the ball bounced by the fielder to allow Bonvino to score easily. Atherton settled down with the lead and allowed only one hit over the next three innings. The Hawks added a crucial insurance run in the fifth. Irwin reached on an error and stole second. Piergustavo popped it up in foul territory near the Tigers bench and, after making the grab, the first baseman attempted to pick off Irwin at second, but the throw got away. Irwin flew home with the third run and her energy fired up both her teammates and the traveling Milford support in the bleachers. 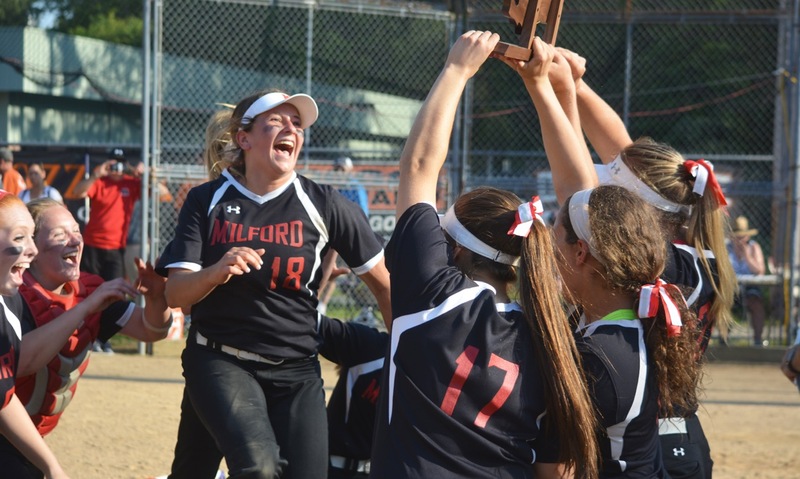 Holding a three-run lead in the seventh, Milford had one foot in the state final, but the Tigers would not go quietly. With one out, Holly Chin singled and an error brought the tying run to the plate. Atherton reached back for a little extra to get a strikeout, but then walked the next hitter to load the bases and bring a potential go-ahead run up to bat. With the Tigers faithful as loud as they had been all night, Atherton induced a comebacker to put an end to the rally. The Hawks have had a target on their backs since the beginning of the season, as they entered as heavy favorites in the Davenport division and as one of the favorites in Div. 1 South. DiVitto tried to explain what carried the Hawks to this point. Milford (24-1), riding a 24-game win streak, will face Central champion Wachusett on Saturday at Worcester State University (time to be determined). TAUNTON, Mass. – In each of the past two seasons, Milford and Silver Lake have met in the Div. 1 South quarterfinal and each time the Lakers had come out on top. On Saturday afternoon, the two teams met again, but this time the sectional’s top two seeds faced off at Taunton High’s sun-drenched Jack Tripp Field with the South title on the line. For the Milford seniors, whose careers began just a year after the program won the second of back-to-back state titles, this was not just a chance to get revenge on the Lakers, but also an opportunity to add to the program’s legacy of success. It was an opportunity that those seniors would not let slip away. Ali Atherton tossed a one-hitter against the potent Silver Lake lineup, which had put up 18 runs in two other games against Hock opponents in the tournament; Maggie Farrell went 3-for-4 and drove in what turned out to be the game winning runs with a third inning double; and Kaitlyn DeCapua went 2-for-4 with an RBI, as the Hawks beat previously unbeaten Silver Lake 4-0 to clinch their second South title. Atherton, the Southern New Hampshire-bound pitcher, stepped into the circle as a freshman with the unenviable task of following arguably the best pitcher in state history, Shannon Smith. Four years later and facing the biggest game of her career, Atherton rose to the occasion and matched one of Smith’s achievements by tossing a shutout in the South final. Atherton held the Lakers hitless through 4-1/3 innings, allowed only one infield single, one walk, and just two balls out of the infield. Considering the stage and the lineup that she was facing, it could could be argues this was the best pitching performance of her career. The Hawks also needed to flash the leather behind Atherton, who remarkably finished her one-hitter with no strikeouts. Maddy Bonvino got it started with a leaping grab of a liner in the second inning to rob Anna Battista of a hit and in the fourth Farrell came charging in to make a shoestring grab on a sinking line drive off the bat of Kelly Danahy. 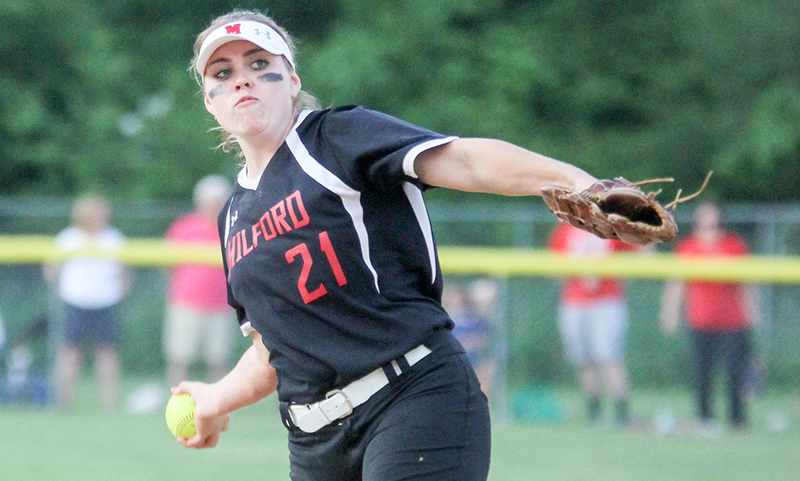 Milford had a base hit in each of its first two at-bats but Silver Lake pitcher Jillian Richards also looked sharp, using her off-speed pitches to keep the Hawks guessing. That changed in the third. Shannon Cormier started the inning with a single to second and moved up a base on a wild pitch. Kate Irwin followed by beating out an infield single. A grounder to first moved both runners up into scoring position for Farrell, who got the pitch she was waiting for and drilled a double into the gap in left center. With two outs, DeCapua singled up the middle to bring Farrell around with the third run and the Hawks had momentum and budding confidence. Milford had the chance to tack on runs in the fifth when Farrell singled with two outs and Jess Tomaso reached on an error, but Richards got a ground out to end the inning. In the bottom half, Battista reached on a grounder that was knocked down by Bonvino for the Lakers first hit, but Atherton got back-to-back grounders to end any threat. In the sixth, the Hawks added an insurance run. Kelley Reichert and Bonvino each singled with one out and Cormier drew a walk to load the bases. Irwin blooped a ball in between the left field and shortstop to make it 4-0. Milford could not break the game open, as Richards got out of the jam without allowing another run. A two-out walk to Danahy in the bottom of the sixth put a little pressure on Atherton, but she got Caroline Videtto to ground out to second leaving power hitter Emily Critch waiting in the on-deck circle. The Lakers put on their rally caps for the bottom of the seventh and the Silver Lake bench was as loud as it had been all game, but Atherton made short work of the final inning before leaping into her teammates’ arms as South champion. Milford (23-1) will put its 23-game win streak on the line against the North champion (either Newton North or Billerica) on Tuesday at Jack Tripp Field at 7:00. TAUNTON, Mass. – The mark of a great team isn’t necessarily how good it performs on its best day, but rather how it perseveres on an off day. Despite being out-hit by third-seeded Hopkinton and connecting for just seven hits themselves, the second-seeded Hawks came up with the big plays when they needed to and walked away with a 6-3 win. Milford advances to the D1 South Sectional Final and will take on top-seeded Silver Lake (25-0) on Saturday at 4:00. It marks the Hawks first appearance in the sectional final since 2013. The Hawks had a strong start to the game, but battled the rest of the way. Ali Atherton (6.1 IP, K, 3 ER) retired the Hillers in order in the top of the first. And in the bottom of the first, junior Emily Piergustavo launched a solo shot just over the left field fence at Jack Tripp Field to give Milford an early 1-0 lead. While Piergustavo was far from done with her day, Milford’s defense was forced to escape a couple of jams over the next three innings. In the top of the second, Hopkinton had a lead off double but Milford got a force out at third, a pop up to first and a ground out to third to escape without any damage. In the top of the third, Kaitlyn Holly reached on a fielder’s choice, stole second and took third on a single from Maille Bennett. A two out walk loaded the bases but Atherton bounced back with a big strikeout to keep Hopkinton scoreless. And in the top of the fourth, the Hillers loaded the bases once again. Singles from Julia diBenedetto and Lillian Morningstar and a walk to Holly loaded the bases with two outs. But once again, Atherton delivered in the clutch, getting a loft line drive to short for the final out. “She’s driven, she’s playing with a purpose,” DiVitto said of Atherton. “She has been focused since last June when we lost to Silver Lake. She’s been focused to get herself to this point to play for a sectional championship. We’re excited for the opportunity, no matter who we play we know it will be a good challenge. 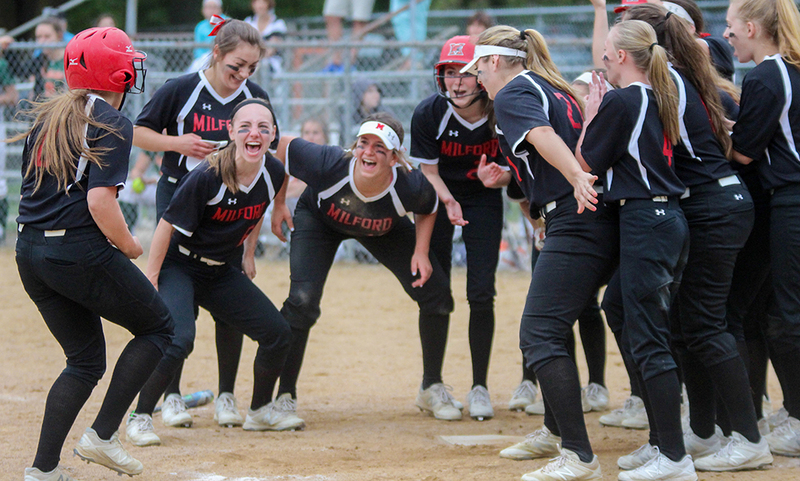 While Milford was escaping danger on the defensive side of the ball, it added to its lead in the bottom of the third. Junior Maddy Bonvino (2-for-3) led off with a single and took second on a passed ball. Kate Irwin then beat out a bunt for an infield single, moving Bonvino to third. Piergustavo drove in her second run with a sac fly, the throw home allowing Irwin to take second. With two outs, Maggie Farrell’s hustle down the line on an infield grounder forced a high throw, allowing Irwin to scamper home to make it 3-1. Milford added another run in the fifth inning. Bonvino once again led of with a single and moved into scoring position by stealing second. This time, Irwin’s sacrifice bunt moved Bonvino to third and Piergustavo stroked a single – her third RBI – to make it 4-1. Atherton retired the Hopkinton side in order in the top of the sixth and the Scarlet Hawks added some insurance in the bottom half. Senior Kaitlyn DeCapua reached on a one out single and sophomore Emily Hartman launched a two-run home run to left field to give Milford a 6-1 lead. Hopkinton didn’t go quietly as Kaitlyn Holly left off with a single, moved to second on a ground out and scored on an RBI double from Heather Holly. Heather Holly moved to third on a single from Lindsay Whittles. Kelley Reichert came on in relief for Milford, getting a ground ball (a fielder’s choice for a run) for the second out and then a grounder to second for the final out of the game. The Scarlet Hawks will take on Silver Lake in the D1 South Sectional Final on Saturday at 4:00 at Taunton High. The Lakers are no stranger to Milford softball, having ended the Hawks season the last two seasons in the quarterfinals. Today’s games are listed below. The list is updated with all changes we have received. Stoughton, 6 @ Canton, 3 – Final – For the second straight game, Stoughton rallied from a deficit and plated the game-winning runs in the seventh innings. Jackson Maffeo’s three-run home run put the Bulldogs ahead 3-0 but Stoughton chipped away, tying the game with two runs in the sixth and went ahead with three runs in the seventh. Ryan Sullivan and Jack Connelly each had a single in the sixth and both came around to score to tie the game. Nick Hardy doubled to lead off the top of the seventh, advanced to third and came home on a double from Sullivan. Luke Johnson followed with a two-run double to put Stoughton up 6-3. Justin Hutchinson earned his seventh win of the seven, tossing three hitless innings with seven strikeouts. Hutchinson struck out the side in the sixth and retired the side in order in the bottom of the seventh. Foxboro, 1 @ Mansfield, 2 – Final – Mansfield’s Colin Gibbons launched a solo home run in the bottom of the fifth inning to give the Hornets a close win over Foxboro. Mansfield took the lead in the bottom of the second when Anthony DeGiolamo (1-for-2) drove in Cullin Anastsia (2-for-3). Foxboro tied the game in the top of the third when Anthony Mollica knocked in John Cronin. Gibbons finished with two hits in the game. Connor Sheehan earned the win in a complete game effort, allowing just four hits while striking out four. King Philip, 1 @ Sharon, 3 – Final – Sharon junior Max Tarlin tossed a complete game and the Eagles’ offense did all of its damage early to notch a non-league win over KP. Tarlin allows five hits, five walks, one earned run and struck out seven in a complete game effort to earn the win. After Ben Stamm battled for a single, junior Drew Naisuler (2-for-3, double) launched a two-run home run to put the Eagles head. Aiden Arnold (2-for-2) followed that with a triple and scored on a single from Danny Emerman. SHS head coach Kee Arguimbau said senior Jake Marglous played incredible defense at catcher for the Eagles. Canton, 4 @ Stoughton, 13 – Final – Nikki Coppola went 4-for-4 with two triples and four runs scored and Karly Estremera went 4-for-4 with a double, a run scored and two RBI to power the Black Knights offense. Gina Carafa had three hits and three RBI and got the win with six innings of work, striking out nine. Shannon Flaherty also had a pair of hits and drove in two for Stoughton. Canton was led offensively by Molly Loughran, who was 2-for-4 with a pair of doubles. Franklin, 9 @ Foxboro, 1 – Final – Franklin scored three runs in the third and added three more in the sixth inning to beat Foxboro in a game continued from Sunday (rain). Franklin held a 1-0 lead when the game resumed. Olivia DiGiacomo (four RBI) went 3-for-4 and put an exclamation point on the day with a bases-clearing double in the sixth inning. Kylie Bouzan added two hits and scored a pair for runs for Franklin. Jackie Cherry pitched four innings, retiring the side in order in the first, second and third innings. Emily Valentino pitched the last three innings and recorded three strikeouts. FHS head coach Kate Fallon Comeau said Tara Hartnett played excellent defense at shortstop. King Philip, 3 @ Milford, 6 – Final – Holding a 3-1 lead heading into the bottom of the sixth, Milford tacked on three runs and then held off King Philip’s late comeback attempt. Shannon Cormier went 2-for-3 with a stolen base, a run scored and an RBI, Kaitlin DeCapua had an RBI single, Maddy Bonvino had two hits, including a double, and a run scored and Emily Piergustavo reached base four times and scored one run. Ali Atherton (three strikeouts) earned the win, escaping a pair of jams in both the sixth and seventh innings. King Philip’s Hailey McCasland, Jenn Hutnyan, Jess Bonner and Nicole Carter each had two hits apiece for the Warriors. Oliver Ames, 0 @ Walpole, 13 – Final – Lexie Campbell had a pair of hits while Victoria Ziner (double), Caroline Mahoney and Katie Mills had recorded one hit for the Tigers. Taunton, 24 @ New Bedford, 0 – Final (5 Innings) – Taunton booked its place in the state tournament with a dominating win against the Whalers. Courtney Fisher and Jaylin Couto combined on a one-hitter and struck out 11 batters. Kya Enos went 3-for-3 with four RBI and homer, Rebekah Lajoie went 5-for-5 with five RBI and a homerun and eighth grader Hannah Aldrich drove in four for the Tigers. Katie Van Zandt (three RBI) and Alexa White also hit homers for Taunton. Canton, 8 @ Mansfield, 10 – Final – Mansfield goalie Sean Powers turned away 12 shots and Sam O’Connell accounted for four points as the Hornets clipped Canton. Tommy Donnelly and Mike Zampine had strong games on defense in front of Powers. O’Connell scored a hat trick and had one assist while Aidan Sacco scored twice and Cullen Murphy, Hunter Ferreira, Joe Cox and Brad Grant each had a goal and an assist. Danny DeGirolamo also scored once for Mansfield. King Philip, 4 @ Canton, 1 – Final – King Philip earned wins at second and third singles and swept doubles play to beat Canton. Martin Matous won 6-3, 6-2 at second singles and Marco DiStefano recorded a 6-2, 6-0 win at third singles. The team of Sam Collela and Ryan Gemelli prevailed 6-3, 6-3 at first doubles and Aidan Ignatius and Jake Webster won 6-2, 6-2 at second doubles. Canton junior Jake Wolicki earned a 6-0, 6-1 win at first singles. Sharon, 4 vs. Bishop Feehan, 1 – Final – Sharon picked up an impressive non-league win, sweeping doubles play and notching two wins in singles play to beat the Shamrocks. The team of senior Alex Romantz and sophomore Danujan Thirumavalavan won 6-1, 6-7, 6-2 at first doubles and Ashwin Sreevatsa and Alberto Olivei won 6-4, 6-3 at second doubles. Fred Bondar notched a 6-3, 6-1 win at second singles and junior Andre Olivei recorded a 6-4, 6-3 win at third singles. Taunton, 5 @ New Bedford, 0 – Final – Taunton recorded its third straight win with a rout of New Bedford. Sophomore Brett Beaulieu won 6-0, 6-0 at first singles, Mike Briggs recorded a 6-0, 6-0 win at second singles and Eric Gwordz won 6-0, 6-2 at third singles. The team of Charlie Fiske and Dylan Kullas prevailed with a 6-0, 6-1 win at first doubles and Kyle Dennehy and Alex Pugh won 6-0, 6-3 at second doubles. Stoughton, 0 @ Attleboro, 5 – Final – Attleboro won all three singles matches in straight sets and recorded a sweep of the Black Knights. Torey Lussier won 6-3, 6-1 at first singles, Bri Aronne won 7-5, 6-1 at second singles and Anna Nelson emerged from third singles with a 6-1, 6-4 victory. The team of Taylor Palermo and Merri Piazza nothched a 7-5, 6-7 (3-7), 7-5 win at first doubles and seniors Brooklyn Palermo and Cam Liberatore won 6-0, 6-3 at second doubles. Canton, 3 @ Milford, 2 – Final – Canton swept doubles play and earned a win at third singles to edge Milford on the road. Kiki Karavas won 3-6, 6-3, 6-3 at third singles to help the Bulldogs clinch the match. The team of Julia Burkowsky and Jena Moyle won 7-5, 6-2 and Stelina Michaelidis and Sarah Hernandez won 6-1, 7-5 at second doubles. Milford’s Julie Rabinowitz won 7-5, 6-1 at first singles and Allison Buckenmaier won 6-2, 6-2 at second singles. Taunton, 5 vs. New Bedford, 0 – Final – Taunton lost just three games in doubles play in a big win over the Whalers. The team of Emily Moor and Ashleigh Eason won without a blemish, picking up a 6-0, 6-0 win at first doubles. Callie Hebert and Jordan Martin recorded a 6-1, 6-2 win at second doubles. In singles play, Olivia Sweeney (first) won 6-1, 6-0, Jordan Pagliuca (second) won 6-3, 6-1 and Jillian Pagliuca (third) won 6-3, 6-2. Milford, 78 @ Canton, 58 – Final – Canton’s Muhammed Sambo and Cordell Smith each qualified for states but the Bulldogs fell to Milford. Sambo came in first in the 200M at 23.1 while Smith finished first in the high jump (5’10). Gerry Sullivan also came in first for the Bulldogs, clocking in at 2:11.9 in the 800M. Canton swept the 400M hurdles with John Guenthner coming in first (1:01.1), Matt Floyd (1:03.6) coming in second and Riley McDonnell (1:04.00) taking third. Milford, 78 @ Canton, 58 – Final – Canton’s Bronwyn Mahoney and Sarah Collins each won a pair of events but Milford prevailed with a win. Mahoney took first in the shot put (29’6.5″) and discus (68’8″) and Collins won the 400M hurdles (71.5) and the 800M (2:34.5). Andrea McNeil was first in the one mile (5:57.4) and second in the 800M (2:37.3) and Jimisha Williams crossed first in the 200M (28.0).